We recently told you about telecommuting robots and how stay-at-home workers are increasingly using such devices to create a virtual presence at their remote workplaces. It now appears, however, that working professionals aren't the only ones taking advantage of telepresence technologies: A six-year old boy with severe allergies from Seneca Falls, NY, is using a VGo robot to attend school — and it's an experiment that appears to be working. To say that Devon Carrow suffers from allergies would be an extreme understatement. Devon's life is continually threatened by peanuts, milk, eggs, certain meats, and other food products. He also has esophagitis disease (an allergic inflammatory response in the esophagus), along with anaphylactic shock syndrome, respiratory distress syndrome, and asthma. Devon's diet is so restricted that he still drinks infant formula, as well as having to supplement with a hypoallergenic Neocate for breakfast, lunch, dinner, and at night. His allergies and other underlying conditions have made it impossible for him to go to school — and for all intents and purposes the poor guy is stuck at home. Devon was homeschooled for kindergarten, but then he and his family were introduced to Kristin Myers, the district's director of special education. She suggested that they try the telepresence VGo robot, and that Devon would be among the first students in the United States to utilize the special mobile technology. They decided to give it a try, and they got immediate buy-in from the school. As a result, Devon now attends classes at a school five miles away from his home. Devon actively participates in his classes, jokes with classmates, "walks" through school hallways on the way to check books out of the library and participates on stage in leadership assemblies at the school. The only two things Devon doesn't currently do with his classmates are gym and lunch. Brachmann said the wireless connection in the cafeteria is limited but school officials hope to remedy that and invite Devon to lunch for additional socialization. Still, through the eyes of Devon's classmates, he's one of them, according to Winchester educators. That was silently proven last spring, when his first-grade class made Devon some "get-well" artwork after a nearly fatal allergic reaction again landed him in Women & Children's ICU. "They drew a picture of a boy," said Brachmann, explaining the class identified with Devon as a person and not as the VGo machine. And as this episode shows, the rest of the class has adjusted quite well to having an apparent robot in the classroom. The kids don't think it's particularly out out of the ordinary, and they act as if he was a regular part of the class. They think he's smart, friendly — and oftentimes funny. Devon can often be found meeting and greeting fellow classmates at the school entrance, and he likes to lead the class in the Pledge of Allegiance. And the kids don't address the robot as VGo — it's definitely Devon. The success of the program is definitely good news. Unless his condition changes — what his mother says is getting worse — Devon will have little choice but to rely on his robot. As Pignataro writes, the technology is quickly attracting the attention of other educators, including districts in Colorado, Arkansas, and Pittsburgh. 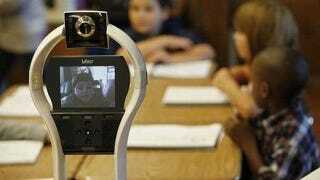 It may only be a matter of time before VGo and other telepresence robots will make their way into other schools. Be sure to read all of Pignataro's account. Images via: Derek Gee/Buffalo News, VGo.